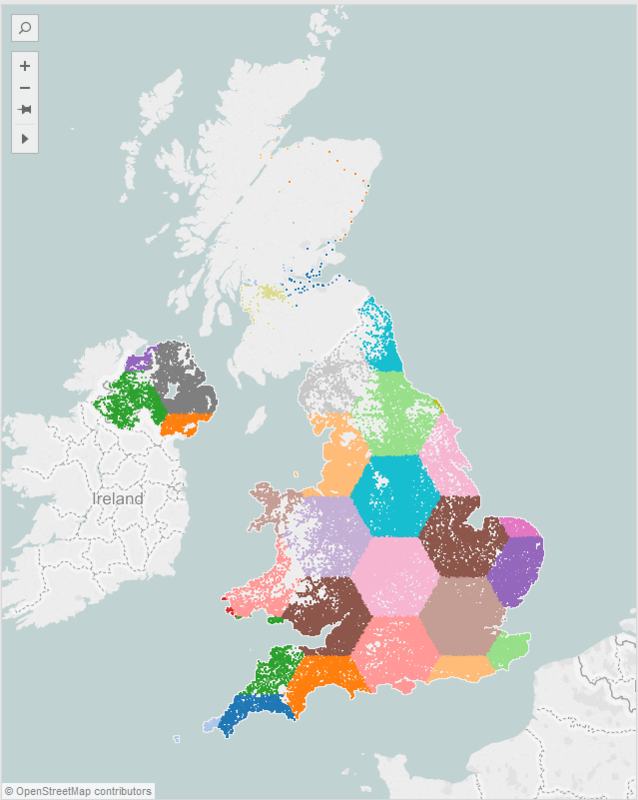 One of the features of Tableau v9 is it’s new Hexbin functions – hexbinX() and hexbinY() – in this post we explore how to use them. Hexbins are, in short, a simple way of grouping two sets of numeric values into groups of similar values for purposes of visualisation. Why Hexagons? Well they tessellate nicely and don’t suffer from the same problems as grid squares which have corner points a long way from the grid center. This will return the X and Y values of the Hexagons, and I then used Hexagon Shapes (downloaded from Kristopher Erikson’s excellent post on the same subject – see bottom of his post here) dropped into my Tableau Shapes Repository (instructions here). Here the aim of [ScaleX] and [ScaleY] are simply to move the X and Y values to an axis with units of 1 (by multiplying each value by the Scale factor), then moving the corresponding point back to the original axis by dividing by the Scale factor. e.g. if you have values ranging from 1,000 to 10,000 and want 10 hexagons across the range, you would use use a Scale of 1/1000, this would first change the 1,000 and 10,000 to values to 1 to 10 for use in the functions – as Tableau requires – then back again to the original axis for display. The Good: Hexbins can make a great mapping visualisation tool if used correctly and sparingly and locally as they allow data to be shown not in arbitary polygons, e.g. State, County. etc but in areas of known size. THE BAD: Firstly Tableau’s Hexbin functions do not account for the curvature of the earth, so longitudes in more Northern latitudes (where the distance of 1 degree of longitude is much smaller than at the equator) will suffer from inaccurancies using these functions. THE UGLY: Secondly since Tableau uses the Mercator projection the values from more northerly latitudes will stretch compared to these in the south to give an uneven tessellation. In the UK a Ratio of 1.61 appears to give a pleasant grid of hexagons – NB here I am sacrificing some data accuracy for looks, note that the length of the hexagons vertically and horizontally may not be the same, thought they look it due to the projection. As with all thing mapping related this is due to trying to display a curved earth on a flat screen. NB the Hexbin functions will not work with generated Latitude / Longitude values from Tableau Geocoding, the values need to be present in the data. Finally below I present a use case for these functions. I have take two open data sources, one for Crime data from Police.uk (5.6 million points) the other from the ONS using their Codepoint dataset of postcodes (2.5 million points). I used the latitude and longitudes in each set to bin the data into Hexagons as above – I used a Zoom parameter of 10 to create a dense set of hexagon grids. I then blended the data on the Hexagon centroids (X / Y) to join the two populations together and visualise crime per 1k of Population per grid. Feel free to deconstruct the workbook to find the details, I’m pleased with the performance given the size of the data. Issues: One issue is that the bins near the coast may contain crimes but due to the locations of postcodes and the way hexagons fall there may be crimes without population, these skew the results and so I have removed populations under a certain threshold. 1. Anti-social behavior is a crime? I’d be in trouble! 2. Tessellate – word learned! 3. What accounts for the white space on the post code map? Hi James – thanks for the comment, glad you learned something 🙂 The white is where there are no people I believe, or at least the census data doesn’t have results! You mentioned “squished” hexbins if the axes aren’t appropriate – how can we adjust for that? Hi Robert – applying the formula I apply in the post and ensuring the weightings translate the X / Y into values that are scaled appropriately will fix this.